I am a huge fan of the Hunger Games. I have loved them from the very beginning. And now it is 27 days till the conclusion and I really don't know if I can wait that long. But to help me (and you) to make it until August 24th you should check out Scholastic's Summer of Hunger Games. There giving away prizes, discussing all the books, and tons more. Check it out here. For a schedule of events click here. 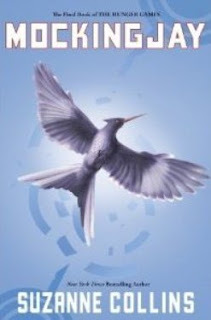 Also I'm giving away a copy of Mockingjay!! It stinks its not an ARC but still at least you won't have to buy your own copy! So check it out. Don't forget to add extra entries if you've already entered! aHH!! SUCH a good series-- but the ending of mockingjay SUCKED!!!!!!!!!!!!!! !